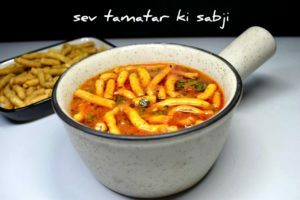 What is Sev Tamatar ki Sabji? Sev is a deep-fried snack made using gram flour and other spices. 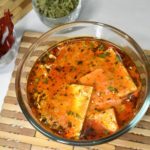 When it is served in an onion tomato gravy is becomes a very interesting gravy preparation which is popular across Gujarat and Rajasthan. Region wise variations exist in the recipes. 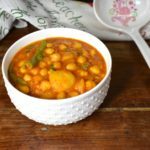 Sev tamatar ki sabji comes to rescue when there are not many fresh veggies in our fridge or we may not be in the mood to have the ones that are in the fridge. The best part about this recipe is that it is ready in less than 30 minutes. And of course, it is very appetizing. Sev, correct sev is important for nicely prepared sev tamatar ki sabji. 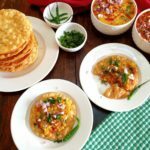 The Bikaneri bhujia won’t do justice to this recipe. You know what I mean! We need a sev that is thicker. I have used a very thick variety. You don’t need this jada (jada means thick in the Gujarati language) sev. But anything in between this one and Bikaneri bhujia would do. 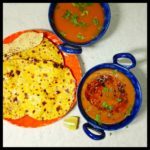 The gravy is the most basic and common gravy used in Indian cooking, onion tomato gravy. 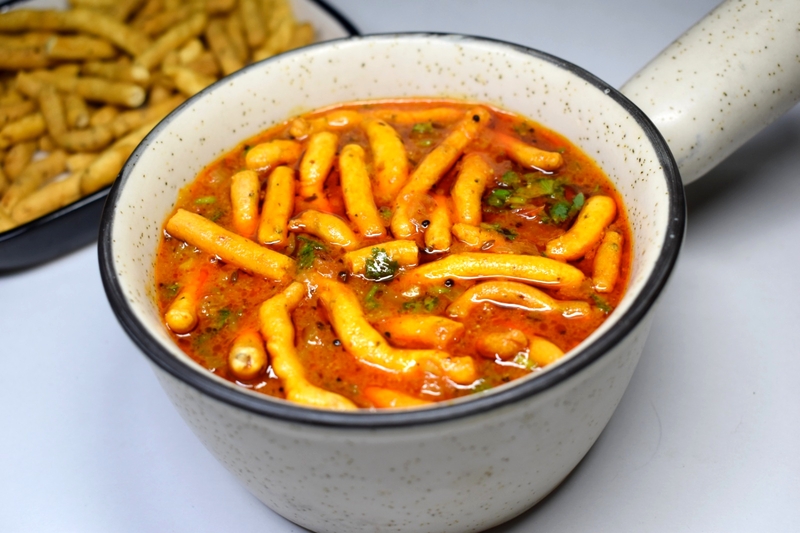 Another sev tamatar recipe that totally delctable is the Rajasthani sev tamatar recipe. Do try this version of sev tamatar too. View the recipe here. There are more fuss-free recipes. 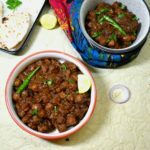 You have got to try Pindi Chole. The recipe can be made with absolute ease. Check it here. 2. Let 1 tsp mustard seeds (raie) crackle and then let ½ tsp cumin seeds (jeera) splutter. Also, add a big pinch of asafetida (heeng). 3. Cook 1 tsp each ginger and garlic paste for 1 minute. 4. Add 2 chopped onions. 5. Spice it up with 2 tsp coriander powder, 1 tsp red chili powder, ¼ tsp turmeric powder, and salt to taste. 6. Next goes in 3 chopped tomatoes. 7. Should be cooked till oil oozes. 8. Add 1 cup water and let it simmer. 9. 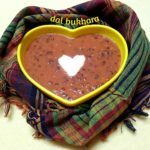 At the time of serving add 1 cup thick sev. Check and adjust the seasoning and consistency. 10. Finish off with a handful of chopped coriander leaves and 1/2 tsp garam masala powder. 2. Let 1 tsp mustard seeds crackle in it and then let ½ tsp cumin seeds splutter in it. Also add a big pinch of asafetida (heeng). 5. Spice it up with 2 tsp coriander powder, 1 tsp red chili powder, ¼ tsp turmeric powder and salt to taste. 9. At the time of serving add 1 cup thick sev. 10. Finish off with chopped coriander leaves.